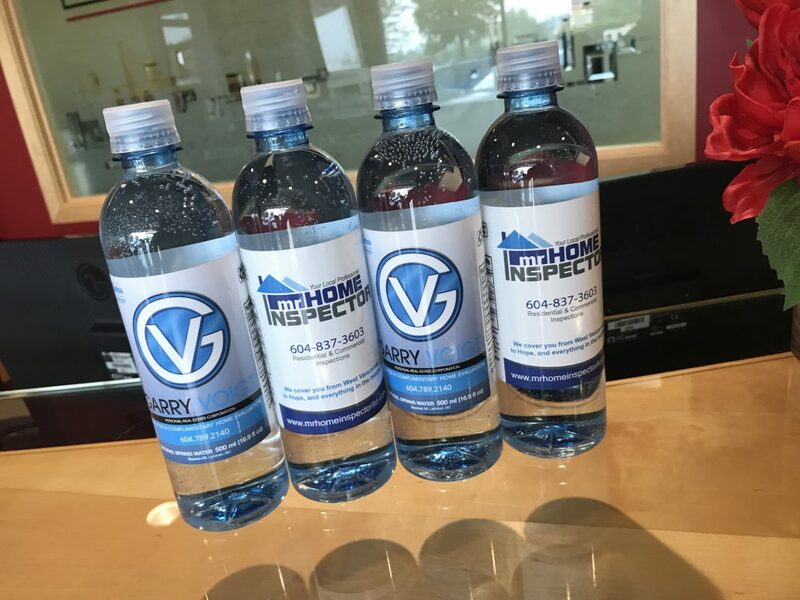 Have you seen our awesome custom Mr. Home Inspector water? If not, you are missing out and ask us how you can get your hands on some. If you have and want more, you know where to find them… anywhere one of our amazing team members are. These water bottles are all part of “Operation Flood the Market”. Whether you are handing out the bottles in the showroom on a hot day or to a client when showing them your listings, using them for promotion at a trade show, golf tournament, fundraiser or other special event, premium bottled water is an effective marketing tool that extends beyond the normal reach of traditional advertising. Fundraisers for schools, charity events, functions like dry grads, Boy Scout or Girl Guide functions, car wash fundraisers etc. BBQs for clients or with friends. Drop off bottles at neighbouring homes of clients. Put a box in new buyers’ fridges on possession. The branded water creates conversations, it creates opportunities. Our Custom Water Bottles come in cases of 24 bottles. We are happy to extend the opportunity to co-brand with Mr. Home Inspector for just $15.00 plus GST per case. However, if you may feel you need an exclusive marketing tool; you are able to do so with your own custom water bottles for $30.00 plus GST per case. Delivery is always free of charge with either option. Getting started is easy! Just send us your branding and we will get the proofs started right away! Please follow the link below for information on how to send your branding. http://www.mrhomeinspectorltd.com/wp-content/uploads/2017/08/Bottle.jpg 3024 4032 Daniel Fedosenko http://mrhome.quasarnetworks.com/wp-content/uploads/2013/11/MrHomeInspector-Logo-340x146-72dpi.jpg Daniel Fedosenko2017-09-20 08:00:062017-09-11 11:21:31"Operation Flood the Market!" Top 10 Latent Defects 3 Home Inspection Outcomes for the Seller!